Well today I just saved a lot of money on my car insurance, and I didn’t even have to switch my insurance to Geico. In fact the only thing I had to do was wait for the clock to strike midnight. Today my friend is my 25th birthday. At exactly one-quarter-century old, I am officially 7 months older than the first release of AutoCAD in December 1982 (phew glad I made the deadline). My first experience with AutoCAD was in 1996, and thus I do remember the first AutoCAD (technically MS DOS) command that I typed; that being ACADR12. I don’t know about you, but for me cold hard cash is always an acceptable birthday gift. So in the spirit of birthdays, and cash gifts I give you FREE plot tracking in AutoCAD! 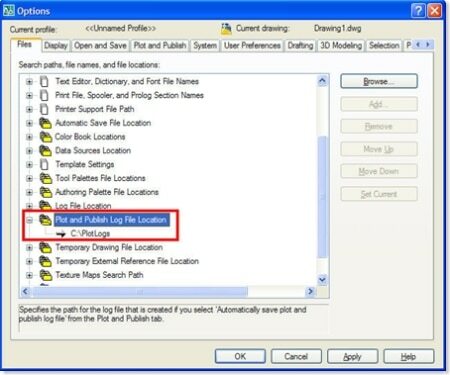 AutoCAD has the ability to write a log of every plot that is sent from AutoCAD. We have two options; a separate plot log file can be created for EVERY plot you make, or the friendlier option to make one “continuous” plot log for every plot you make. Making this feature even more helpful is the fact we can define where we want the log file to be written. Thus if you give everyone write access to a directory on your server, you can have AutoCAD generate a single plot log file for your entire company. So how exactly is this done? 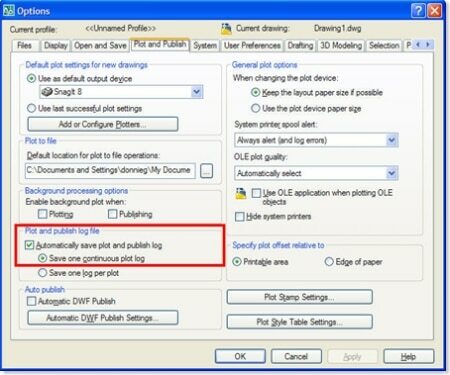 Go to the “Plot and Publish” tab under options (OPTIONS command). 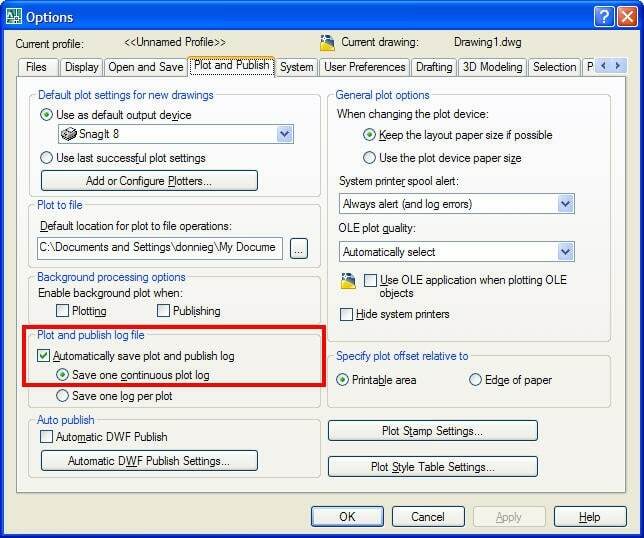 To enable the logging feature, click “Automatically save plot and publish log”, and select the “Save one continuous plot log” radio button. After enabling the feature, go to the “Files” tab (also under options), and find “Plot and Publish Log Location”. Change that path to a shared directory, and hit [Ok]. 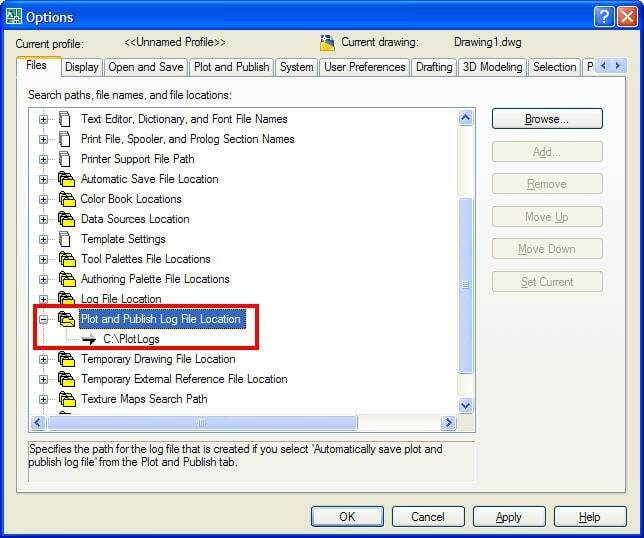 AutoCAD will create a CSV (comma separated) file in that location. Each time someone sends a new plot it will be appended with the information about that plot. Using that CSV file you can use something like MS Excel to analyze the file and generate a billing report for your plotting. Do you have an idea where it get the job name from? @Darcy â€“ Admittedly the system is not 100%, as it does allow some plotting to fall through the cracks. As you have discovered through your own investigation, this method assumes that you are making a single copy of each sheet. Thus be it Sheet Set Manager, or the standard PLOT command, copies beyond the first will not be tracked. Column A contains an abbreviation describing the contents of that row. VR = Version, HD = Header, JS = Job Start, SH = Sheet, & JF = Job Finish. Unfortunately the Job ID column is all but worthless when tracking, as it is not a sequential number. I have been working on a way to analyze this data in MS Access with no luck. Currently we use Excel to analyze Column A to determine the row type. The only issue I have with using this method of tracking plots is that it does not appear to track multiple plots (sets) when printing via the Sheet Set Manager. Also, could someone elaborate on what the first two columns in the plot log file are? Column A shows VR (I assume this is for “version” and then HD (no idea what this is for) below that. Column B is the Job ID, but what do the numbers in this column represent? @3Pinter â€“ Here (at Timmons) we have an extremely homegrown excel table. Basically we use a series of lookup functions to analyze the username and determine the department. We also use some other excel formulas that look at the drawing path to determine the job number. After all of that we use the Pivot Table function within Excel to generate the report for accounting. That should get you pointed in the right direction as for using the Plot Publish Log feature. Our homegrown excel table just uses normal formulas â€“ no macros. As for the plot stamp method. I am aware of the feature, but havenâ€™t explored it in depth. I know the Plot Publish Log generates a single file (with the exception of a handful of plot jobs) regardless the number of users. So to answer your second question I would have to do some research myself. Question however: how do I filter the information using excel? Does anybody has some sort of a macro or a excel-template for this? You can achieve the same results but have more control over what items are placed in the plot log by using the command “plotstamp”. It is also ‘one-stop shopping’ as you can set everything up in this one interface. It is also worth mentioning that the plot log (.csv file) can easily be imported into MS Excel and manipulated to allow for tracking and billing uses. In our office, we have written an “idiot proof” reference guide for both setting up PlotStamp and importing the data. This makes it much easier to get a new AutoCad setup running again. Plesseym â€“ I wouldnâ€™t imagine you having too much trouble in a 20-30 person environment. We (Timmons Group) currently have 7 offices with a total of about 250 CAD users. This is the method we use to track plotting from AutoCAD. As you mentioned you have to provide a location that is always accessible to your users (insuring they have write access to the directory). We did have one instance where the server location went down. People could still plot, but an error message was displayed telling the user the plot log couldnâ€™t be written to. Other than that one instance when the permissions got messed up on that server path, we have had absolutely no problems with this method. Thanks for your comment â€“ and Iâ€™m glad to know you have enjoyed my blog! Thanks for the idea. Have you ever implemented it in a say 20-30 person autocad environment. Will the log file be okay when say 10 people try to plot at the same time? The problem I faced is that the network location must always be accessible. Temporary network glitches result in a hung up autocad. Atleast this was my experience in older versions of Autocad. Another Civil 3D Taurus. AND…. you’re younger than Zeeben. Rock on. We needed a new pipsqueak.